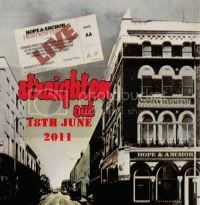 Please note that STRAIGHTEN OUT - A TRIBUTE TO THE STRANGLERS. has been postponed and will now take place on Saturday 18th of June. All tickets will be valid for the rescheduled show. Has this definately been changed ? Just heard from the band, apparently the gig has been put back. Apologies for any inconvenience caused. New date is now June 18th. Don't forget to book for this one peeps. We are now nearly into May and the Hope and Anchor gig will be on us before we know it, so don't forget to book your tickets soon. Not long off this now and don't forget this gig will filmed for a DVD release. Only a week to go now, gonna be a good one can't wait. Fatbusjim wrote: Only a week to go now, gonna be a good one can't wait. No need to keep rubbing it in! I tried to make him laugh, He didn't get the joke, and then he said I wasn't right in the head. The band's website states that the gig will NOT now be filmed. It's not the Stranglers without Cornwell. Can't wait for the gig on Saturday, went to see them at Swindon and cant believe how good they are. The band has gone from strength to strength, and I belive it's the best line up yet. Phil the guitarist not only sings and sounds like Hugh but has an uncanny look of him. Went on the webpage to have a look at the reason it's not being filmed and the person who was meant to be filming it has gone AWOL. Bubba didn't you used to be in the band? Its good to see you still follow them, and I can see why they are fantastic. European female wrote: Bubba didn't you used to be in the band? Its good to see you still follow them, and I can see why they are fantastic. Yes, I did the first two years '08 and '09 with them, but I've not seen them play since I left, except on youtube. I agree about Phil - his playing and singing is spot on but not only that, I believe he has an extra ingredient of onstage confidence and swagger that I didn't, and it contributes to the stage performance greatly. He goes for the look more too - with Hugh's choker and quiff; he recently appears to have modified the finish of his telecaster as well, to look like Hugh's road-worn one from the early band. Great stuff - I'm so happy for Mick, I regretted leaving the band more for his sake than anyone's.